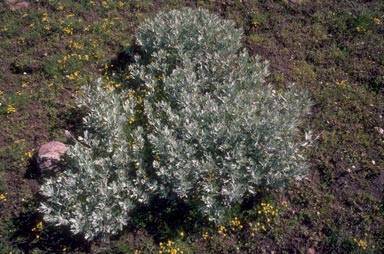 Washington, northeastern Oregon, and west-central Idaho, Reports of stiff sagebrush occurring in western Montana are apparently the results of misidentification. 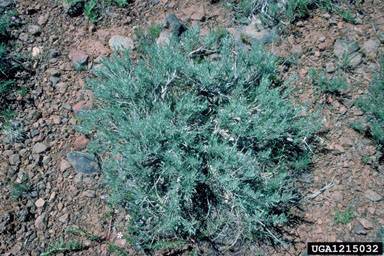 A. rigida occurs in more arid climates that usually have severe moisture saturation in the winter and requires that there be at least seventy days that are frost free. It is found anywhere between 700 ft. to 7000 ft.
A rigida is usually found above 3000 ft. in Washington and is most common in shallow, stony sites mostly in the southern part of the state. A. rigida thrives in harsh, unproductive sites that are shallow and stony and usually are above basaltic bedrock. A. rigida is considered a climax species of the areas it inhabits. It is a late successional species that takes many years to become dominant. Seed, Cuttings from branches and roots. Collect by hand and separate seeds using tweezers, seeds can be cleaned by hand using a metal screen. The seeds are mature between September and November. In spring seeds in ground are viable. Seeds are short lived and last less than 5 years in warehouse storage although some subspecies can be stored for longer so the ability to store seeds for an extended time is probable. No stratification is required but a 5 month outdoor winter stratification of the seeds is recommended for plants growing in colder climates. The seeds are surface sown and need light to germinate. The medium should be kept slightly moist during germination. Prior to cleaning seeds can be stored in paper bags in a well ventilated drying shed. After cleaning the seeds they can be stored in a sealed container at 1 C for no longer than 2 years. Seeds should be germinated on slightly moist medium and must be surface sown and exposed to light to root. A stable root system should be established within 4 weeks and the seedlings should be placed in individual pots. From germination to harvest should be about 10 months but this can vary due to growing conditions and the conditions in which the seeds were collected. A. rigida germinates well on commercial soil-less medium such as 50% milled sphagnum pete, perlite, and vermiculite. In its natural state A. rigida grows well in sandy well draining soils like loam and is intolerant to alkaline soils. Sparsely planted, after seedling is larger than 4 in. it should be planted in an individual container. During germination the medium should be kept moist and after good root establishment watering 3 to 4 times a week is necessary if habitat is extremely hot watering should be increased. A. rigida is slow growing and may take up to 3 years to produce viable seeds. Most tridentata lives to be 40 – 60 years old but it can reach ages older than 100 years particularly in “unfavorable sites” where most other plants do not thrive. Baton Rouge, LA 70874-4490 USA.